Lockheed being in Secret Wars keeps paying off! Inside front cover ad is for issue four and its tie-ins. I would think it would be better at the end of the issue and the ad for issue threr be repeated up front, so people know what other issues that need to be bought. That’s just how I would do it. But an ad for subscribing to the Star Comics line of comics is better suited at the end, right after an ad for the proper Marvel Comics line. Issue opens with a blonde Beyonder in human form, sleeping on a street corner. He is still new to the whole Earth situation. A police wakes him up and he moves along. Beyonder is still tired when he meets Toots, a lady of the night. She offers her services and recommends a nearby hotel. Beyonder creates a gold bar and that scares her off. He goes to the hotel and gets a room. The fronk desk clerk plans on stealing from him, once he is sleeping. Fortunately, Vinnie – the local mob boss – has other plans. Vinnie will show the Beyonder around town, explain life and what is worth doing. Vinnie wants to know the Beyonder’s story. Which begins a three page recap of Secret Wars and the previous two issues. Look how cute Lockheed looks between Iron Man and the Human Torch. Vinnie teaches him how to eat. Beyonder cures all of Vinnie’s . . . gals of the evening, of any diseases they may have. Beyonder starts creating gold bars by the barrow load. On top of that, he transforms Vinnie’s wife’s body back to the way it was when Vinnie first met her. Vinnie teaches Beyonder about gambling. Days later, Beyonder has moved up Vinnie’s ranks. He also is a brunette, which is how I remember him as. He doesn’t wear the white track suit / Elvis outfit yet. Beyonder runs into Toots and tells her that he sees people as people. Over at Vinnie’s estate, he tells Beyonder that he is meant for bigger things. Vinnie is comfortable where he is on the ladder of life. 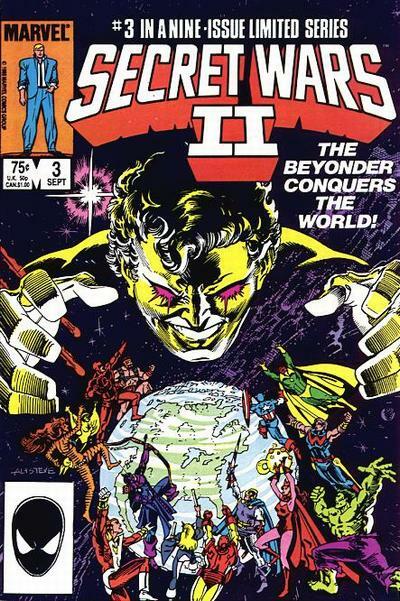 Beyonder starts getting bored and wants more. He takes over the Kingpin’s criminal empire. Next, America. Then, the World. Later, all molecules. It escalates fast as this is all done in three pages. Molecule Man notices his molecules are trying to be tampered with and fixes his own. Volcana, his girlfriend, does feel odd. Molecule Man knows this is the work of the Beyonder, so he corrects her molecules. They go back to watching F Troop. Beyonder runs into Circuit Breaker, the lady cyborg from the Transformers comic. Good thing they don’t show up, as then Marvel wouldn’t be able to reprint this issue. Transformers 9, is referenced. Beyonder revisits his friends and they all are also super content. He runs into Toots, who has decided to go back to a normal life. Luckily, she tells Beyonder that people need free will to strive. Beyonder releases his hold on everyone. He goes to Avengers Mansion to learn from other gifted people, how they cope with using their powers but not dominating weaker beings. Jarvis tells him that the Avengers are off planet, dealing with the Skrulls. Issue ends with Beyonder disappearing to help them, immediately returning and regretting making things worse. Beyonder’s next step is to hire Matt Murdock. As Secret Wars II affects the New Mutants in a major way, mostly in their own title, I own a large number of these issues. 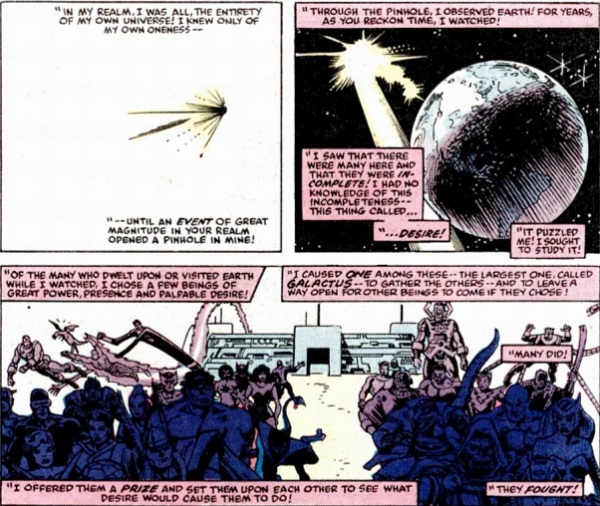 Rachel tries to fight the Beyonder at some point, so the X-Men get involved as well. Of the nine issues, I only don’t own issues – 2, 4 and 6. Not too bad, for a crossover. So I will get around to reviewing those issues eventually.